The latest mystery puzzle on the geopolitical chessboard is who was really behind that failed military coup to overthrow Turkey’s President Recep Erdogan over the weekend? Erdogan immediately blamed his former ally and now exiled enemy in Pennsylvania – the 75-year old Islamic cleric Fethullah Gulen. The Turkish labor minister went so far as to charge the United States with inciting the quickly quelled “uprising” as described by both Erdogan and Western media. 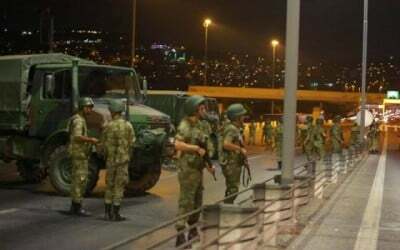 A rebel Turkish military faction seized two airports closing a third as well as closing both bridges over the Bosphorus Strait separating Asian Turkey from European Turkey, and launching air attacks on Istanbul and Ankara with helicopter gunships and F-16 jets as well as tanks rocking Ankara’s parliamentary building and Turkish intelligence headquarters, totaling 294 deaths from last Friday evening through the morning hours on Saturday. The Erdogan government immediately honed in to arrest senior military officers in command at Incirlik Air Base in southern Turkey, which closed temporarily the crucial launch pad facility used by US Empire for airstrike dominance over Syria and Iraq ostensibly to target ISIS terrorists, the same proxy war terrorist allies that both the US and Turkey for the last four years have been deploying in their still ongoing regime change war against Assad’s Syria. Turkish police are now searching the air base after Incirlik’s commander’s was arrested for his and others’ involvement over the weekend allowing the base to be used for refueling planes deployed during the foiled coup attempt. Incirlik also happens to store the largest NATO nuclear arsenal. In the weekend’s aftermath, a number of analysts, pundits and political armchair quarterbacks are all abuzz, speculating that the sultan madman Erdogan, known for executing false flags against his own citizens, may well have staged yet another clumsily faked operation this weekend. Already by Monday the sultan arrested over 6,000 of his enemies in the Turkish military and Turkish legal system in a nationwide purge. By Tuesday that number extended deep into security police and teachers alike, skyrocketing to 20,000 arrested or suspended, eliminating in one fell swoop any and all serious threats from anti-Erdogan opposition camps. Perhaps for that very reason alone, in rare form even every rival political party in the Ankara Parliament unanimously condemned the coup from the get-go, knowing if they didn’t, the resurging dictator-in-charge would include them in his lethal kill roundup too. European Union leaders are expressing concern that the dictator has abandoned all rule of law arresting thousands from his alleged preplanned lists of potential enemies. BBC Arabic, Sky News Arabic, El Arabiya TV, the ITN diplomatic editor, the US networks were all running commentaries saying Erdogan was finished, or had fled to Germany. “The turning point in last night’s morality play in Turkey came when images of Erdogan speaking into his iPhone were broadcast and spread virally over social media,” calling his citizens into harm’s way to hit the streets in every Turkish city to both ensure the coup would be unsuccessful while proudly celebrating the historic moment together as one unified people and nation in an Erdogan-esque kumbaya moment. It’s time to have solidarity with the Turkish people… At this moment people in different cities are in the streets, the squares [protesting] against this coup d’état attempt. Typically what do political leaders do when they’re struggling to stay in power? They launch a fake coup or war, sabre rattling against internal or external threats to rally a jingoistic nationalism amongst its malleable, flag-waving citizenry. Barely two weeks went by since Erdogan was forced to grovel at Putin’s feet, with an apology letter for last November’s shoot down of the Russian jet, including full financial compensation to the pilot’s bereaved family. Since ascending in 2003 to Turkey’s PM job and presidency in 2014, a few days ago Erdogan was floundering at his weakest low point, his political life barely hanging by a thread, on the outs with both US and prominent EU powers like Germany, brushed aside and scorned with louder threats of NATO dis-membership and EU barring, dreams of his Ottoman Empire shattered with his ISIS buddies’ defeat in Syria and Iraq, increasing acts of deadly terrorism at home that has virtually shut down his nation’s critically vital tourism industry, his recession-racked economy frozen in stagnation, and Kurdish opposition groups and political enemies galore growing by the minute. What a difference a few days can make with what increasingly appears to be a staged coup. Now Erdogan’s back in the driver’s seat with carte blanch authority to bring back the death penalty (only abolished when he’d hoped back in 2004 for EU membership) and permanently remove every real and imagined opponent he’s ever had using as his scapegoat blaming an exile protected by the US government as the coup mastermind. Of course the accused cleric Gulen insists that Erdogan “staged” his own failed coup. Erdogan himself on Saturday described the weekend’s unfolding events as “a gift from God,” a brilliant stroke of luck, lending yet more credence to growing legions adhering to the false flag theory. Another highly suspicious loose end that the Erdogan regime propped up to announce to the world allegedly occurred during Erdogan’s flight back from his seaside holiday resort town Marmaris. Two F-16’s piloted by rebel flyers could have easily shot Erdogan’s plane out of the sky but for some mysterious, unexplained reason failed to snuff the leader when they had their best chance with his plane locked in their sights. If that’s true, and a renegade military faction was actually serious about deposing the president, Erdogan would never have made it to Ankara. Erdogan further boasted how minutes after he’d leave a location in Marmaris, bombs were suddenly exploding right behind just missing him by minutes. His megalomaniac bravado always seems to destroy his already near nonexistent credibility. This “inside job” theory is but one highly plausible choice, that Erdogan did arrange his own failed coup to reinvent himself overnight as the popular “hero” of his nation’s 80 million strong population. Another equally probable explanation could be that Erdogan might actually be telling the truth for a change, that the US Empire and Gulen did actually orchestrate the attempt to remove him from power. Proponents of this conclusion cite the fact that a sizeable portion of the imam’s loyal diehard following happened to be in high places in both Turkey’s military officer command as well as standing high court judges. Reports are circulating that they’d been alerted that they were already on a purge list for impending arrest roundups and hence they rushed to cheat their own fate by pulling off a last minute, slipshod effort to take down the sultan before the sultan took them down. The surfacing of preplanned purge lists can also be used to promote the contention that the coup effort was real. The controversial religious leader Gulen had a falling out with his ex-buddy Erdogan over a corruption scandal back in 2011. Prior to then, for years the two had been self-serving, mutually allied supporters of both each other and Islamic jihadism. Also for decades Gulen has been steeped deep in US deep state ties – namely the CIA and Department of Education. The multibillionaire Gulen worth $25 billion owns the largest network of charter schools throughout America and hundreds more throughout the world, and since 1998 lives comfortably on a large remote compound near small town Pennsylvania. Through three prominently known CIA officials, Gulen was able to receive permanent US residence status and his green card to evade prosecution for treason in his own country. Gulen schools worldwide teach Islamic extremism and funnel graduating students into the CIA-terrorist pipeline. Gulen and his Islamic movement along with the Turkish government both have actively worked with CIA’s covert global operations to create insurgent terrorist forces from Chechnya to the South Caucasus, especially throughout Central Asia all the way to western China’s Xinjiang Province, stirring up anti-Moscow and anti-Beijing Islamic terrorism by exploiting various native Muslim populations through Gulen’s jihadist school indoctrination from the Tatars to the Uyghurs. Gulen has long played a central role in the US foreign policy to transform virtually all of both Russia and China’s border neighbors into hostile enemies in order to isolate and weaken the two powers that most threaten US Empire’s unipolar sole superpower hegemonic status. Virtually from the Turkish coup’s onset, Erdogan began demanding that Washington arrest and extradite Gulen back to Turkey. After calling Turkish accusations that the US played any role in the attempted power grab “utterly false and harmful,” fork-tongued John Kerry stated that if Ankara hands its evidence over to US authorities that prove the imam is in fact responsible for the coup, then the US government will send Gulen back to face trial, but not until then. But because Gulen has been such an integral influential presence and asset in both America’s foreign policy as well as worldwide propagandizing as a school of terrorism machine, the odds are extremely nil that the exiled leader would ever be forced to return to Turkey to face sure death. Meanwhile over the last year on a different but related matter, the Obama administration has chosen to militarily support the Syrian Kurds in which Turkey has long targeted the Kurds as its eternal ethnic enemy, with many Kurds inhabiting southeastern Turkey fighting for independence as Erdogan orders brutal assaults to ethnically cleanse Kurds from the entire region, continuing his Turkish airstrikes against Kurds living in northern Iraq fighting ISIS, and sending ISIS militants across the Turkish border to kill Syrian Kurds and Assad forces. The Turkmen brethren the Azeris’ April fool’s invasion of the ancient Armenian homeland Nagorno-Karabakh aroused Erdogan’s promise of continued support “to the end” against another sworn enemy – the genocided Christian Armenians – illustrating over a century long history of Turkey’s lustful binges of ethnic purging. As another slap in the face last month, Germany formally recognized the Armenian genocide. With the Greater Israel Project dictating US Empire’s vision to balkanize Syria, Iraq, Libya and potentially Turkey, Kurdish autonomy fits right in synch with their imperialistic Great Game plan. In response to Erdogan’s reckless behavior in recent months, both Europe and Washington have at least publicly given the erratic despot their cold shoulder, secretly preferring to see Erdogan ousted. Hence, the apparent overt support for last weekend’s coup against him. Thus shunned by the West, Friday night into Saturday’s skullduggery could well be direct payback against Erdogan for his recent shift toward détente with Russia. Journalist Andrew Korybko suggests Russian intelligence could have even tipped Erdogan off of the coming coup attempt. Also if Turkey really believes that the US Empire was behind an actual conspiracy carried out to destroy Erdogan, why after only a day or so would Erdogan allow the US to resume using its Incirlik Air Base again? After all, such a covert criminal offense would be considered an act of war. Why wouldn’t all diplomatic relations be immediately cut off and all American Embassy personnel sent home? In all likelihood, the entire weekend’s events was a joint false flag operation by both Turkey and the United States. The US continues to protect Gulen and his global methods of preaching jihadism worldwide while a fake spat erupts temporarily between Empire and its longtime crucial NATO puppet ally Turkey. This is perhaps the most viable explanation and how clandestine backroom deals are typically forged under false pretenses on the geopolitics chessboard. Potential blackmail maintains the lie that keeps all the criminal players in check. And increased authoritarian control in one country is good for increasing authoritarian control in all countries according to New World Order’s code of psychopathic conduct. At the end of the day, or more aptly at the end of the weekend, the bottom line is, Erdogan has morphed from just days earlier as a NATO liability and political pariah to the most dangerous despot currently holding more power than he’s ever had in his life. And whether he alone staged the false flag or US-Gulen forces staged a botched coup, or all parties are guilty to one extent or another by either complicit or actively plotted and executed design, Erdogan still holds another three million more Syrian refugees he can unleash at any time to Europe as punishment should he be exposed and held accountable. In effect, Erdogan holds the cards to further extort more concessions over and above the $6 billion the EU’s already agreed to cough up to make him stop flooding yet more refugees onto the European continent that’s already teetering on the brink of total self-destruction. It’s the grossest form of perverse injustice when the likes of the US, Israel, Saudi Arabia and Turkey have collectively created the terrorists and caused the wars driving the mass migration crisis, with Israel and Saudi Arabia flatly refusing to accept refugees, and Turkey holding power to extort a weakened, compromised Europe into accepting Turkey’s heavy-handed coercion into EU membership while further charging extortion fees, then threatening to create a far worst crisis if additional demands aren’t met. On top of that, the barbaric conditions and criminal abuses perpetrated especially inside the Turkish refugee camps have resulted in yet another appalling humanitarian crisis. When a handful of evil, mentally ill psychopaths rule the world as they do, this is what we get – a world out of control and ready to terminally explode.